Joel Cooper celebrates a goal for Glenavon. Pic by Pacemaker. Joel Cooper could be heading out the Glenavon exit door before the close of the January transfer window. Confirmation today of a pre-contract agreement between the player and Linfield for a summer switch is expected to spark an angry response from within the Lurgan Blues fanbase due to how the deal has been handled. As a result, Glenavon may seek to facilitate an immediate move from Mourneview Park, with a potential player swap between the clubs one option. News that Linfield had lodged paperwork with Cooper’s signature at the Irish Football Association was leaked around 24 hours before the sides’ weekend Danske Bank Premiership game at Windsor Park. Glenavon recorded a 3-2 win but manager Gary Hamilton opted to remove Cooper from the starting side and place the Northern Ireland under 21 international on the substitutes’ bench. 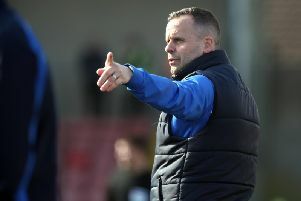 Cooper assured his boss that, although discussions had been taking place between Linfield and a player entering the final six months of his contract, no deal had been signed prior to kick-off. Hamilton accepted the player’s word but felt it necessary to take Cooper out of the spotlight for the high-profile game rather than risk any potential negative scrutiny by supporters. The information that Cooper subsequently contacted Hamilton the day after the Linfield match to reveal his decision to sign on Sunday will only increase ill feeling from Glenavon fans towards the former Ballyclare Comrades playmaker. Hamilton recently distanced himself from a January move to sign Linfield’s Aaron Burns on a pre-contract agreement given the anticipated financial demands. He is, naturally, a long-time admirer of Andy Waterworth but would accept any move for the feared forward remains unrealistic. A more realistic option may be Jordan Stewart, who has struggled to secure a regular starting spot of late since his return to Linfield and would fit the profile of a potential Glenavon target given his wages and increased competition in that position with Cooper’s arrival. Linfield’s squad depth compared to a relatively threadbare panel at Glenavon should encourage the potential for negotiations over a quickfire deal. Cooper has yet to start in a Glenavon victory since his return from America and Hamilton has spoken of the importance of trust within his squad. Although Cooper’s team-mates may understand the circumstances behind a pre-contract agreement to the defending Irish League champions, the initial angry reaction from supporters to the situation only strengthens the logic for both clubs to reach a rapid deal.